"People Under Communism: People Who Made Migs"
For the greater portion of the last half of the Twentieth Century, one monster over all others haunted the dreams of Americans, making their blood run as cold as if they had walked into a room full of vampires with a chorus of werewolves in the wings. Although most would have trouble accurately describing the monster, they could certainly name the source of their revulsion. That name was Communist! Communism is a political and economic philosophy based on the ideology of Karl Marx. The ideal Communist society is one where all property is shared, there are no social classes, where each member of the society works for the betterment of the society as a whole, and where each member of the society is secure in the knowledge that all of their needs will be met by society. Although there have been experiments in communism throughout history, including the Spartacus slave revolt in Roman times, several Utopian societies in 19th century America, even in the Acts of the Apostles (Ch. 2, v 42, 44 and 45). As idealistic as these notions seem, they are contrary to the core values of Western society, which are based on individualism and personal freedom. Marx believed that world wide Communism was inevitable, and that it would be achieved through a revolution led by the working classes. As Tsarist rule in the Russian Empire devolved into a quagmire of corruption and insanity, revolutionary factions saw that the time was ripe to install a Communist regime. The Bolsheviks under Vladimir Lenin were able to seize power due to the weakness of the Tsarist and the promise to get Russia out of the First World War. After consolidating their hold on Russia, a stated goal of the Union of Soviet Socialist Republics was the spread of international Communism. Part of this policy was the support of radical organizations in other countries, including the United States. These actions helped to make the USSR a pariah in the community of nations during the years between the World Wars. 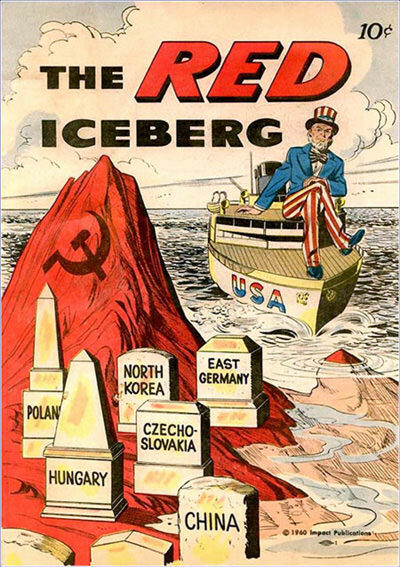 A "Red Scare" hit the West in the years after the Russian Revolution. Many of the shows in our collection dated before WWII call attention to the oppression of Soviet Russia. The supposed state sponsored infiltration of American affairs by agents of the Soviet state are mentioned in The March of Time. The syndicated Ports Of Call seems to begin praising the Soviet "Worker's Paradise" and then proceeds to tell the story of fall of the Tsars and the bloody rise of the Communist state. Father Coughlin regularly took advantage of his radio pulpit to rail against the evils of Communism. When the Nazis came to power and Germany and the full scope of Hitler's expansionist ambitions became apparent, the free nations of the West found Russia to be a powerful, if uncomfortable ally. Both Roosevelt and Churchill were desperate to keep Soviet forces in the War, even making concessions to Russian leader Joseph Stalin. When the War ended, the European economy was in dire straits, the British Empire was fading into the sunset, and the only remaining superpowers were the United States and the USSR. To many observers, a showdown seemed inevitable. The Cold War between the Superpowers came to define the post War years. An important face off occurred in the 1948 Berlin Blockade, as reported by Walter Winchell on Jergen's Journal. In August of 1949, it came to light that the Soviets had developed their own atomic bomb. If communists had been boogeymen before, with the threat of atomic war, they became full blown monsters. On the radio, action heroes who had fought Nazis and Japs during the War now had a new foe to vanquish, the Commies. The Green Hornet, Counter Spy, This is Your FBI and many others dedicated themselves to finding and foiling Communist plans. The evil Commie was an easily adaptable villain for the psychological thrillers of Suspense. The specter of atomic annihilation through a policy of MAD, Mutually Assured Destruction, was a constant and pervasive theme of the Cold War Era. Its most obvious result was to renew the Red Scare. Some saw communists hiding in every dark closet, while the slightest brush of "pink" could ruin a personal and professional reputation, with or without actual proof of Communist sympathies. Edward R. Murrow's courage to face up to Senator Joseph McCarthy's witch hunt practices may be the exception which illustrates degree of the hysteria. 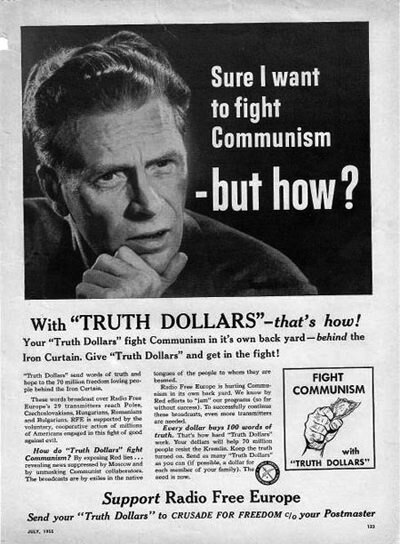 An important theme of the Cold War was preventing the spread of Communism. Some Communist theorists believed that Russia in 1917 was too backward for a successful Communist Revolution. In many ways China was even more backwards and agrarian than Russia, yet with end of the Chinese Civil War, the People's Republic of China became a Communist regime under Mao Tse-tung. In June 1950, with backing from the PRC, the North Korean People's Army moved south of the 38th parallel. The Korean War was feared to be the opening strains of World War III, and although the 1953 armistice brought an end to the fighting, a state of war still exists on the Korean Peninsula. 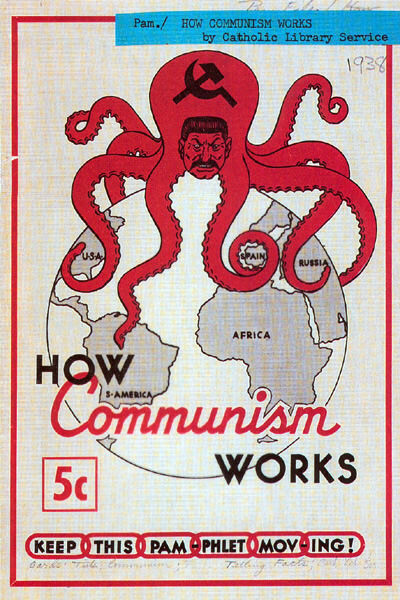 Eventually, Communism did come to the Western Hemisphere. Meet the Press reports in 1959 on the rise of Fidel Castro as prime minister of Cuba, just 90 miles from Florida. In 1991, the Soviet Union collapsed and the Cold War came to an end. China remains a Communist power, and is considered a superpower. However, if a conflict with China exists, it is mostly economic rather than militaristic. This collection is part of the larger Red Scare in Old Time Radio compilation. Be the first to comment on "Communists and Cold War"